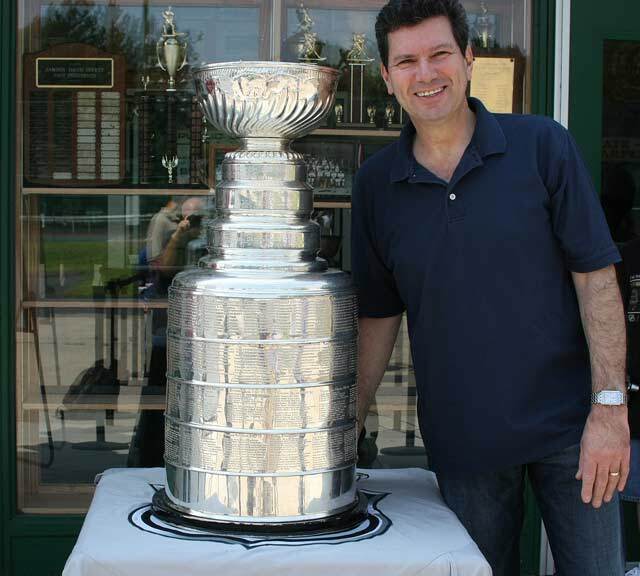 I’m not sure I can explain why, but I needed my picture taken with the Cup. Yesterday, I was awakened by the warble of the phone. It was 11:45 and Rick Gentile was calling. I hadn’t seen Rick in years. He runs Hamden’s hockey rink where Stef learned to skate as a pre-teen. “We’re getting the Cup tomorrow,” Rick said. He was speaking of the Stanley Cup. It’s the prize you win (disregarding any cash) when you win the NHL playoffs. I’m not a hockey fan, but I know the Cup and its travels. Unlike other exalted sports mementos, Lord Stanley’s Cup travels during the off-season and is very accessible. It’s tradition that members and staff of the winning team have custody for a few days. Chris Scoppetto of Hamden is the assistant equipment manager of the Detroit Red Wings and this week it’s his turn! I’m not sure I can explain why, but I needed my picture taken with the Cup. I woke up early (for me) and headed to the rink. 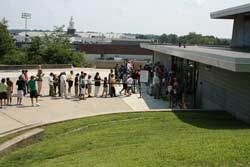 There was a longer line earlier, but by the time I arrived the wait was no more than five minutes. The Cup, which yesterday had been at a Wooster Street pizzeria, would only be in Hamden from 11:00 AM to 1:00 PM sharp. The Stanley Cup is interesting, because it’s grown over time. It was at first just a cup with no base. Then, as more and more teams won it, additions were attached to the bottom. It started 7″ tall. It’s now over 35″! It will continue to grow. I looked closely at the earlier names (click for a closer look). It looks as if they were punched into the side of the bowl in a very non-artsy working class fashion. The little close-up on the left has Gordy Howe, Alex Belvecchio (see Woody’s note in the comments below), Marcel Pronovost and Terry Sawchuck listed. Even I recognize those names from the pre-helmet, toothless thug era. Now THAT’s a piece of Stanley Cup trivia – they mis-spelled Alex Delvecchio – not Belvecchio. Correct as always! This page has a ton of facts about the Cup.